The Leave It to Cleavers, sporting a mostly-new roster of fresh meat skaters, took on the Sisters of No Mercy in the evening’s first bout. 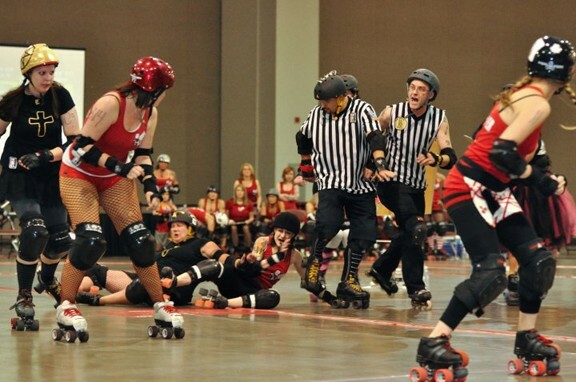 It was the same match-up as last year’s SCDG Championship bout (which the Cleavers won), but with a whole lotta new girls in red. The Sisters got on the board first; Nyda the Dead going for an early flash of scoring jams as the Cleavers looked dazed and confused. Cleavers China White and Muffin Splitter (who was knocked around like a pinball by Sisters for the entire bout) evened up the score after toeing up to the jam line for several runs, but both teams jacked up their defense to the point that there was more hitting than scoring at that point. The Sisters took back the lead before the half, even though most of their team was in the penalty box at any given time. Score at halftime: Sisters of No Mercy 37, Leave It to Cleavers 25. The second half the first bout belonged to Cleavers jammer Chine White, who put her team back in the lead with a pair of “hot tricks” (5-point scoring jams) and didn’t let up for the rest of the game. Not that the Sisters gave in; they responded with harder hits, more strategic defensive moves and tenacious scoring by Alexa Rough, Ashes to Ashes and Nyda the Dead. 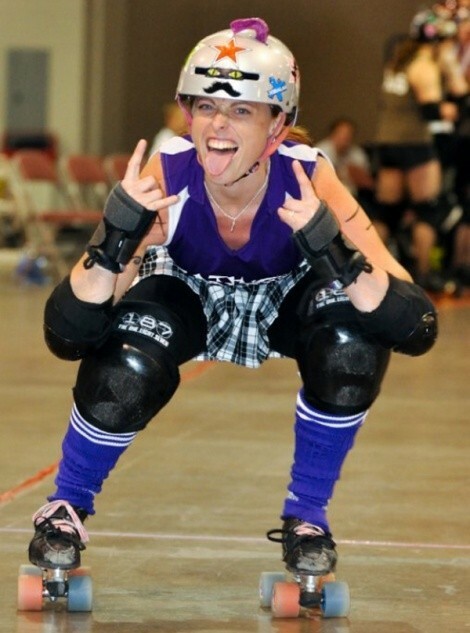 But, it wasn’t quite enough in a taut bout—final score: Leave It to Cleavers 85, Sisters of No Mercy 63. 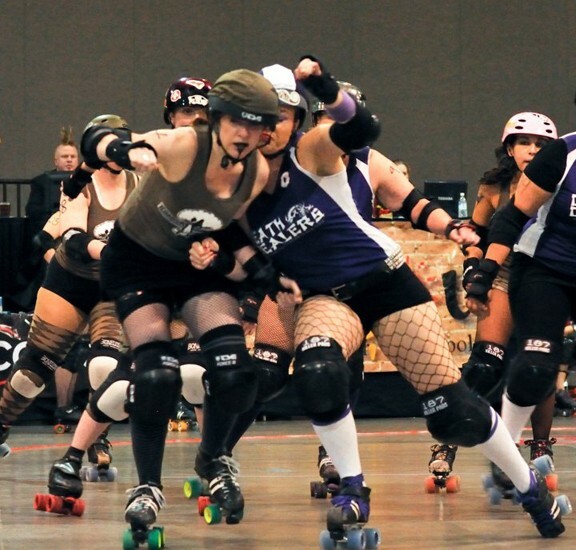 The second bout of the night was not quite as evenly matched: The Death Dealers, arguably SCDG’s most consistently strong team, took on the Bomber Babes, not-arguably the league’s least consistent. 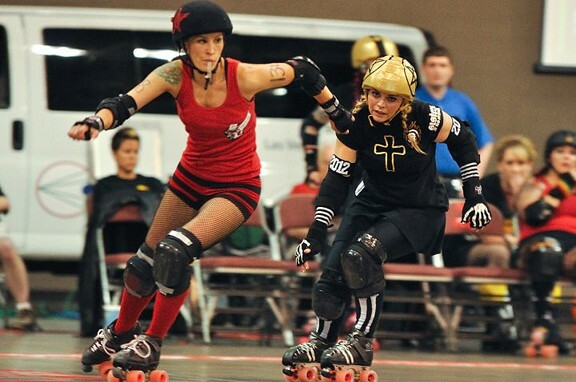 From the first jam, Dealers jammers Roller-Her Kitty and Moonraker dominated the scoring, despite all attempts by Bombers jammer NOS (one of the league’s best) to keep up. Newer Bombers MotoRedhead and Pushy Galore turned in respectable jams but, overall, the Bombers’ fresh-meat heavy lineup (almost as many rookies as the Leave It to Cleavers) was no match for the more-experienced Dealers. 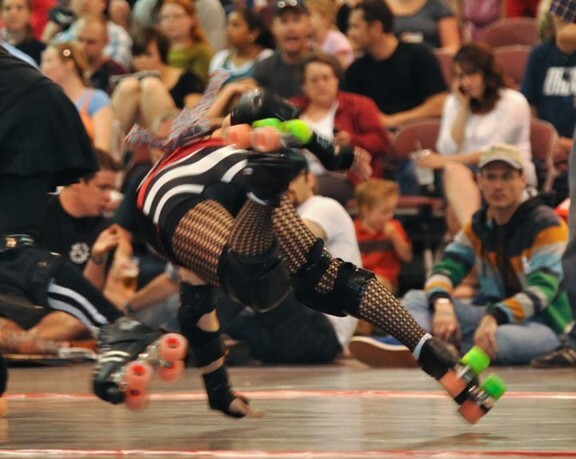 Score at halftime: Death Dealers 105, Bomber Babes 36. 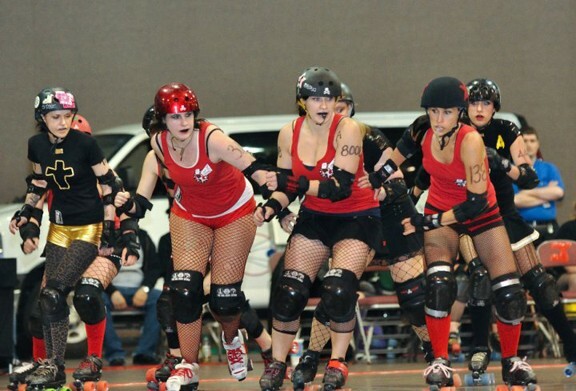 Dealers Moonraker and Roll-Her Kitty continued their scoring smackdown into the second half, but let newer team members The Instigator and Lady Gogo take turns on the jam line as their point spread over the Bombers widened. Bombers blocker Phatal Pheromone was out for blood and bruises, taking every opportunity to knock down Dealers and spend a little down time in the penalty box, but to little avail. 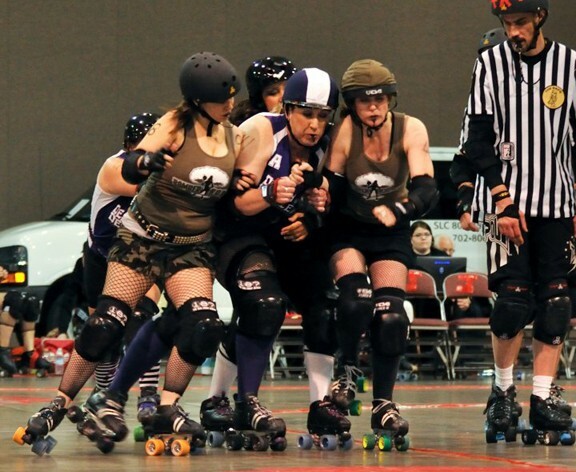 Final score: Death Dealers 153, Bomber Babes 66. 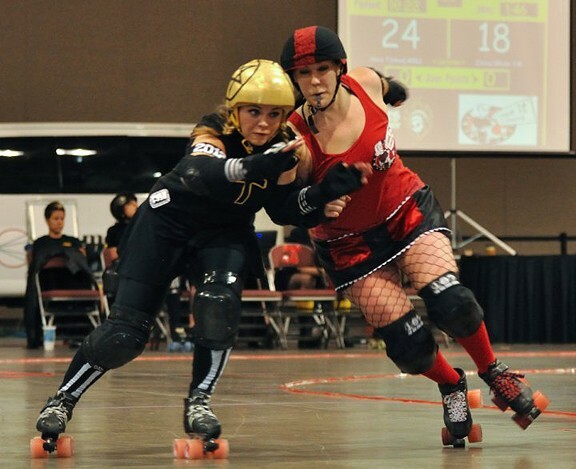 Next Salt City Derby Girls bout: Saturday, June 12 at the Salt Palace; a double-header featuring the SCDG all-star Shakers taking on Fort Collins, Colorado’s FoCo Girls Gone Derby, then the Bomber Babes against the Leave It to Cleavers. Tickets and info: SLCDerby.com. 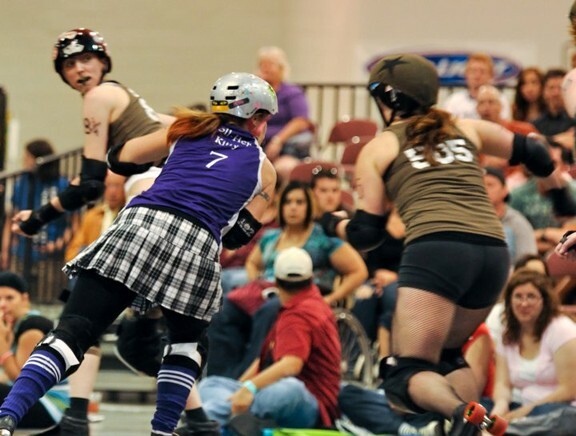 Full 2010 schedule for all local teams at Utah Roller Derby: 2010 Preview. Shots from Saturday’s bout by Liquor’n Shooter. First five: Leave It to Cleavers in red, Sisters of No Mercy in black. 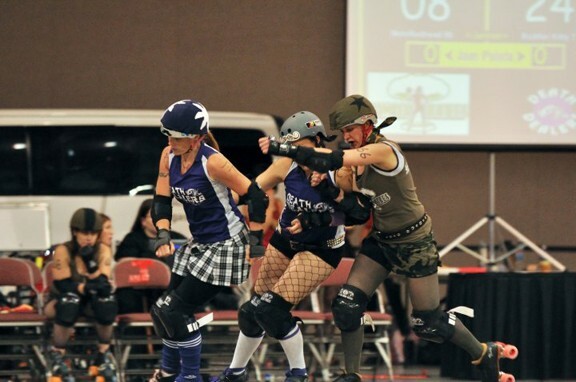 Second five: Death Dealers in purple, Bomber Babes in green.